This undated image made available by the Centers for Disease Control and Prevention shows a large grouping of Legionella pneumophila bacteria. 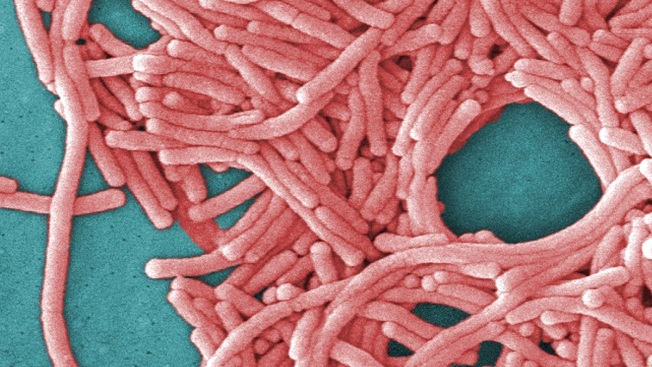 A Legionnaires’ outbreak that sickened 27 people and led to one person’s death has been traced to a housing complex in Upper Manhattan. The cooling tower at The Sugar Hill Project, at 898 St. Nicholas Ave., near West 155th Street, was the likely source of the cluster found in Washington Heights, the city’s Health Department said. The Legionella strain found in the cooling tower matched the strain found in six patients affected by the cluster, according to the department. “The facility fully cooperated with the Health Department in the investigation, cleaned and disinfected its cooling tower on July 13 and is working with the Health Department on long-term maintenance to meet the city’s cooling tower regulations,” the department said. The department’s news came as the MTA confirmed that two agency employees have contracted unrelated cases of Legionnaires' disease. The employees, who work at two different locations, were both treated for the disease, MTA Bridges and Tunnels said. “Out of an abundance of caution we are working with the State Health Department to conduct a full investigation,” the agency said. Legionnaires’ disease, a form of pneumonia caused by the Legionella bacterium, can be contracted by breathing in contaminated water droplets. It can’t be passed from person to person.